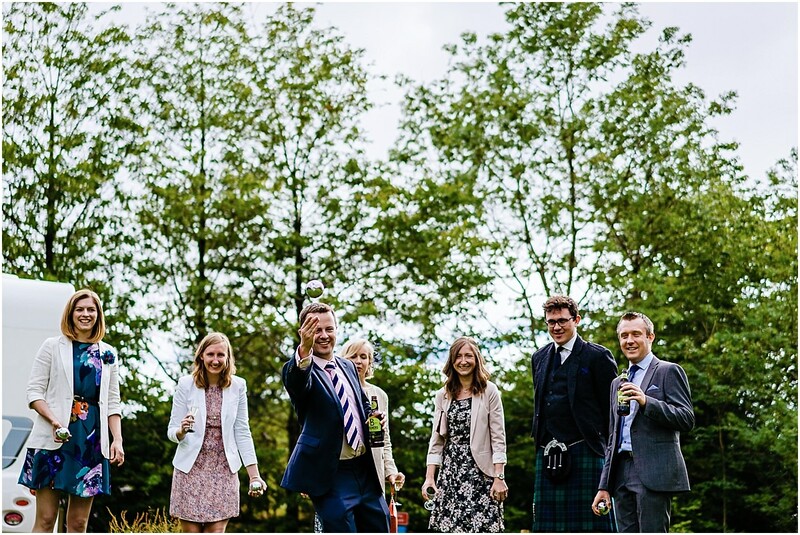 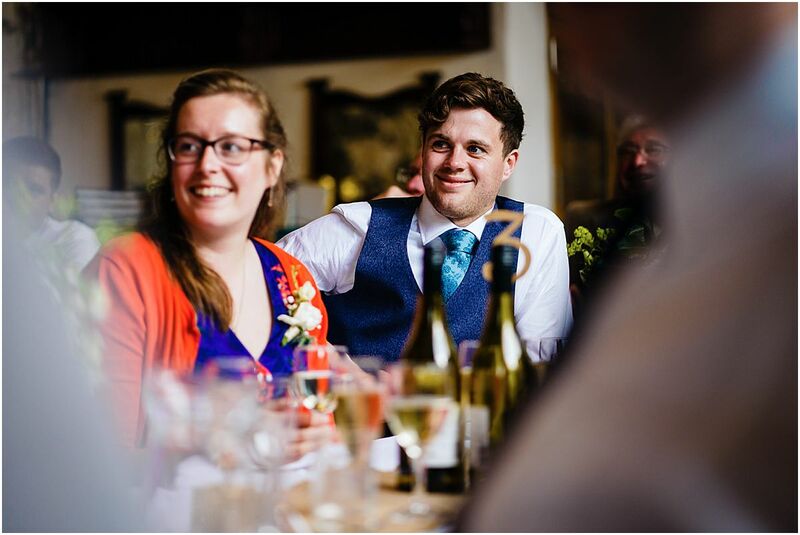 Photographing at Helen and Mike’s wedding was one of the highlights of the season. 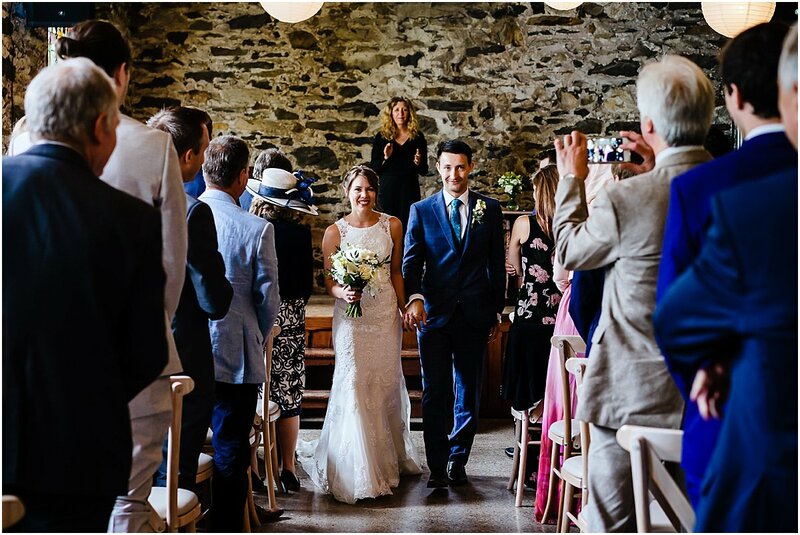 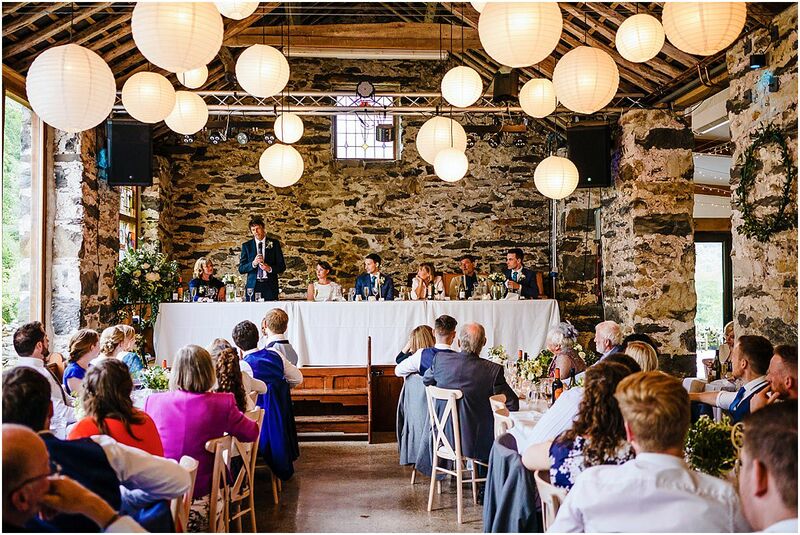 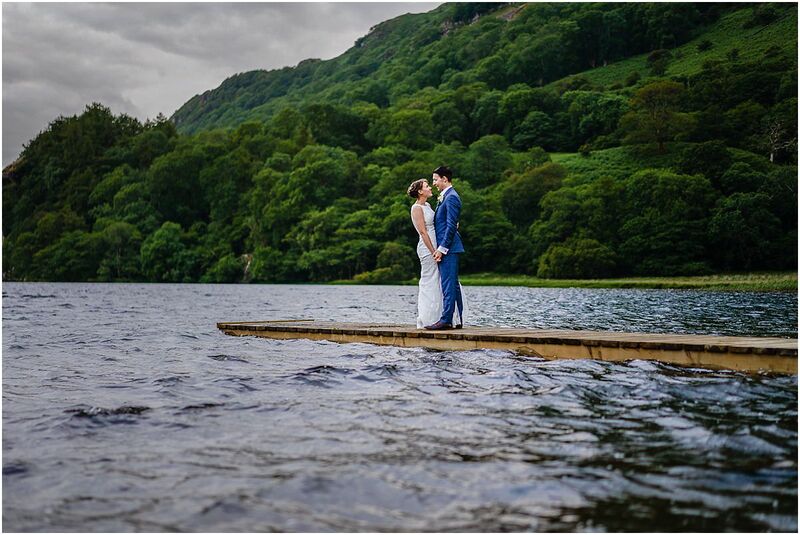 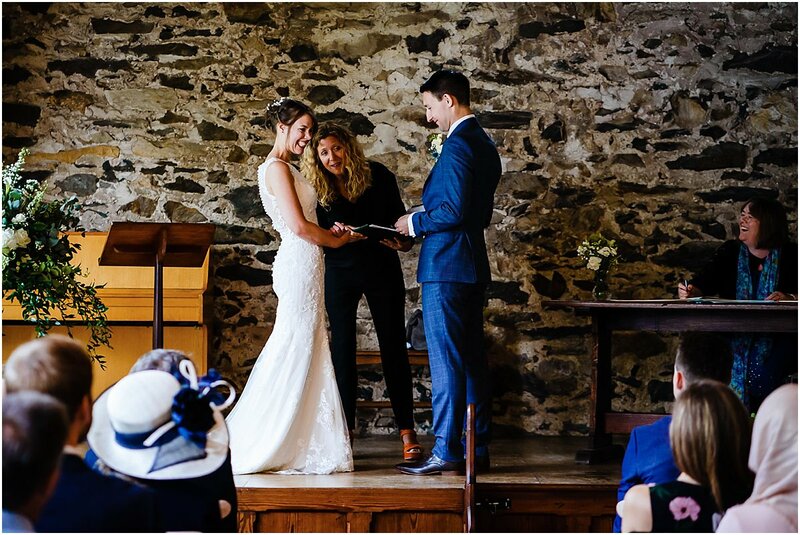 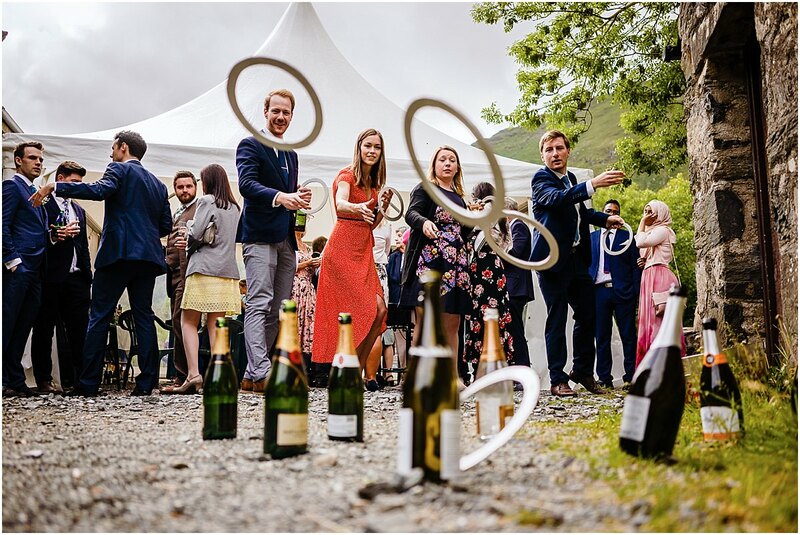 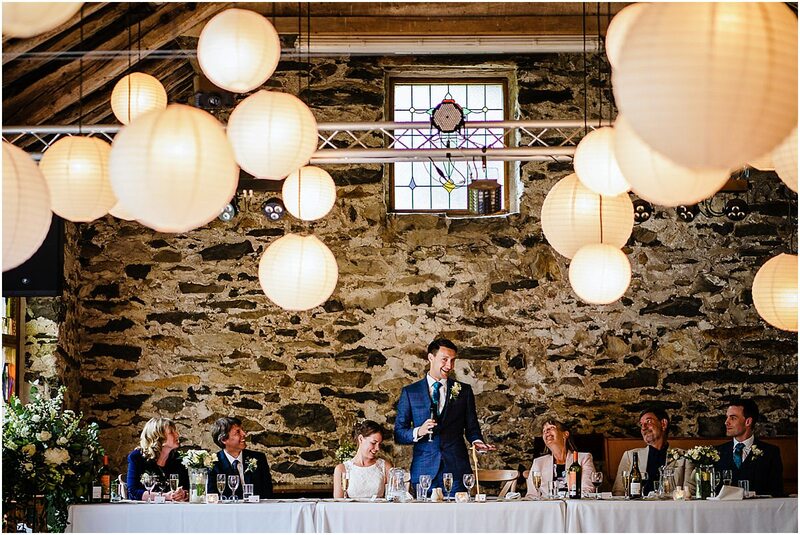 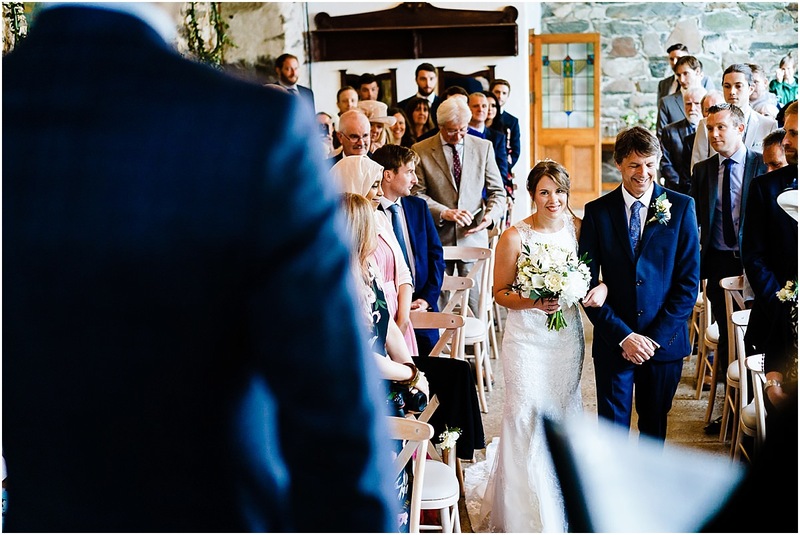 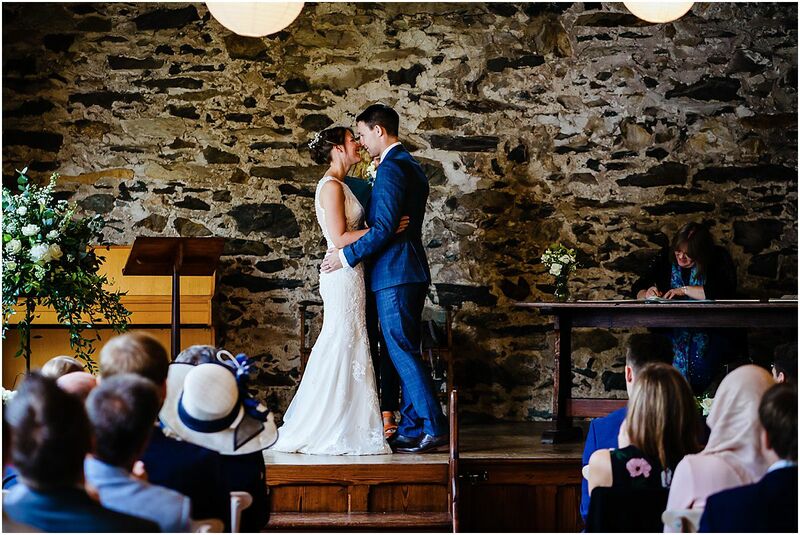 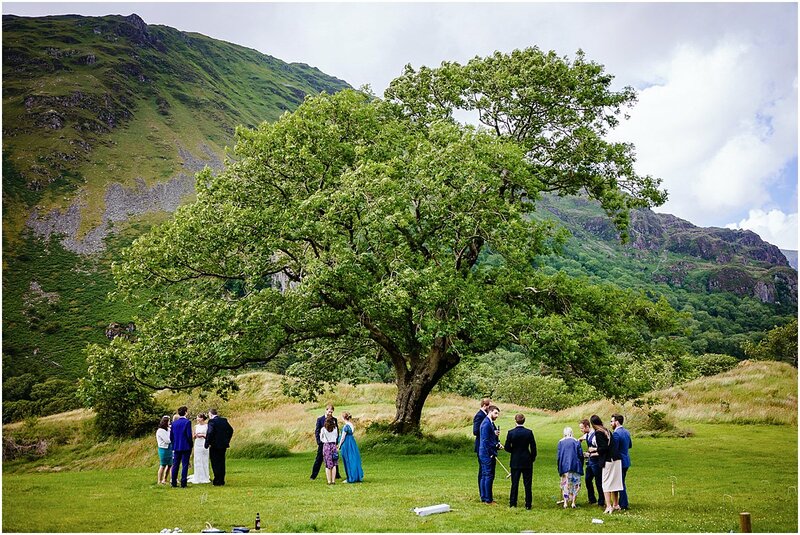 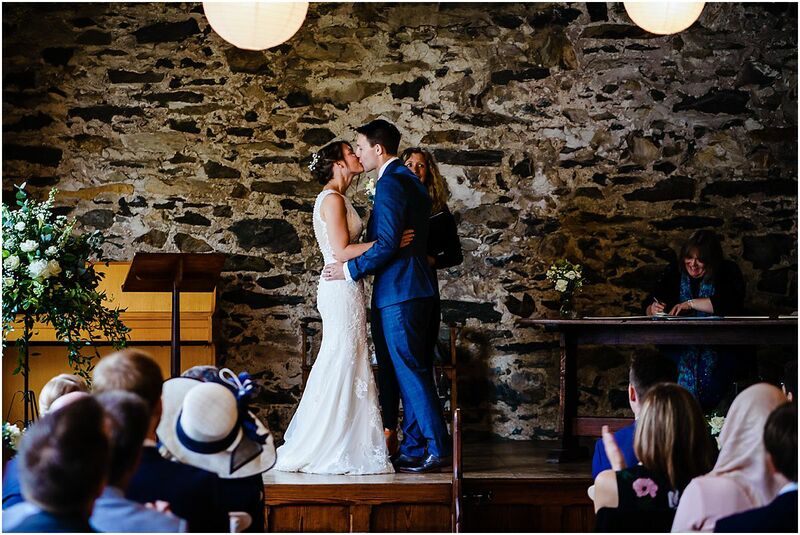 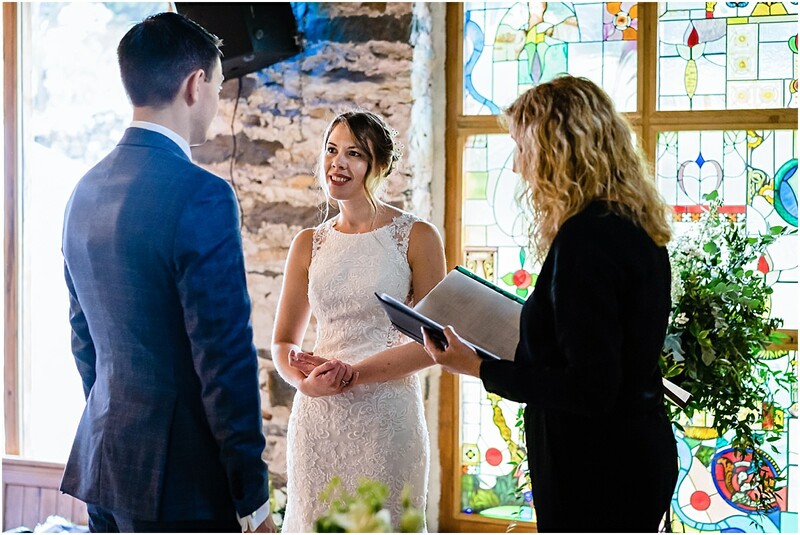 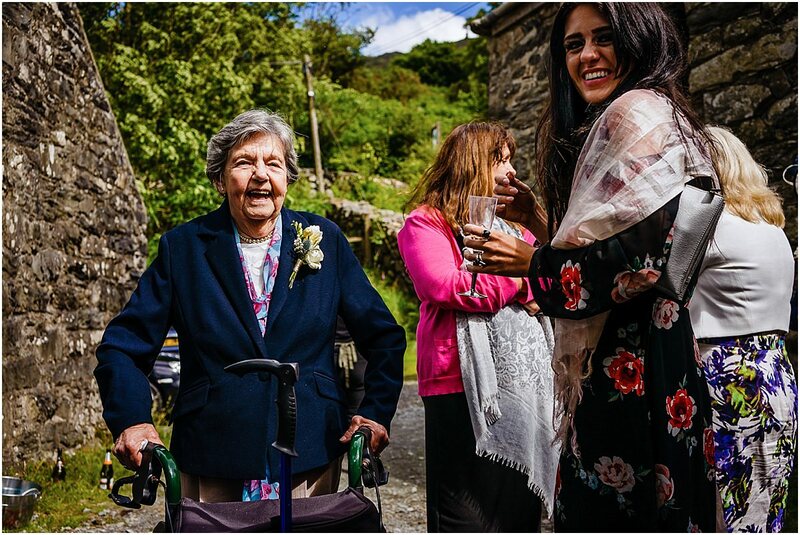 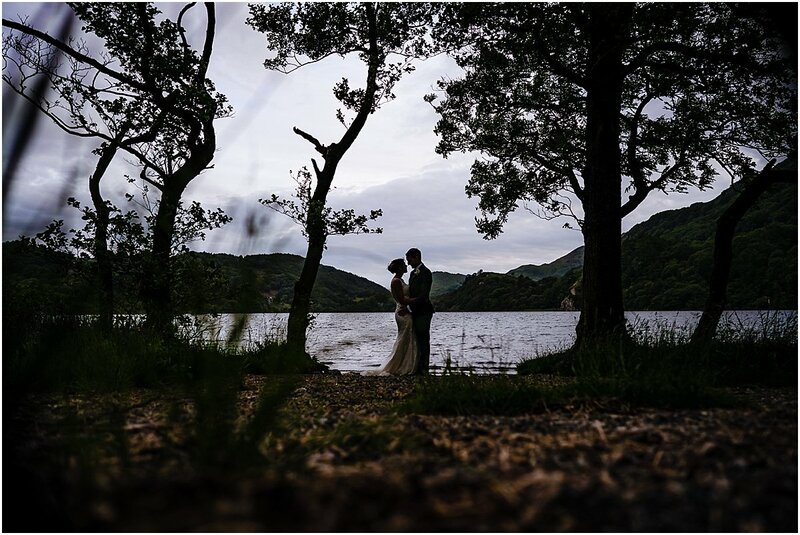 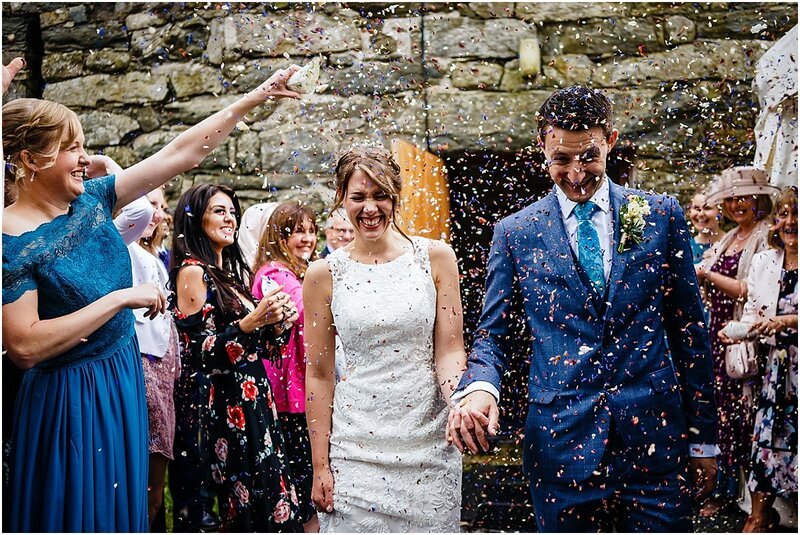 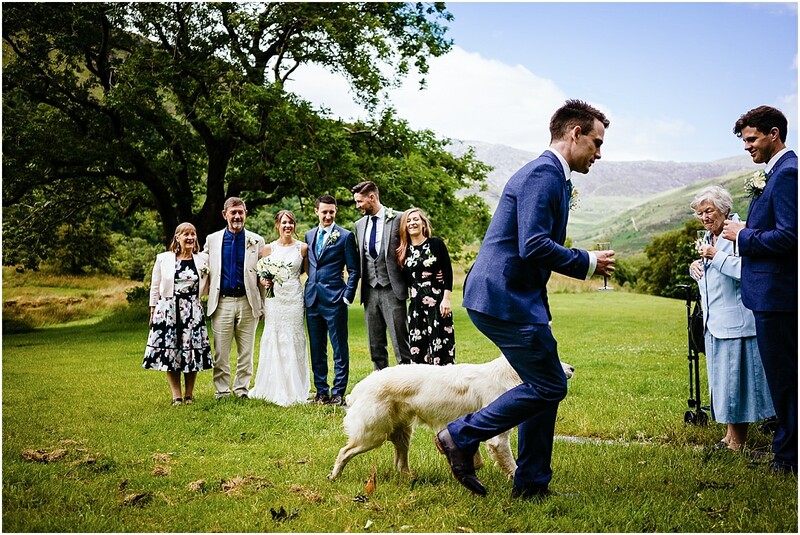 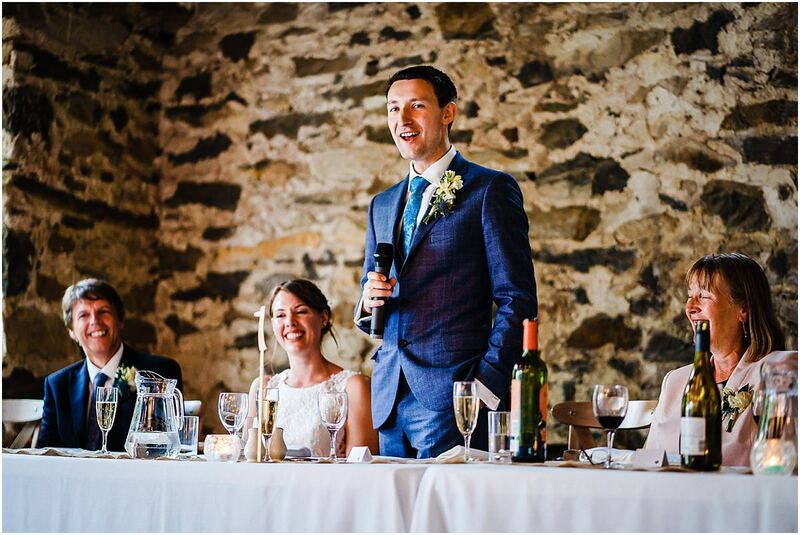 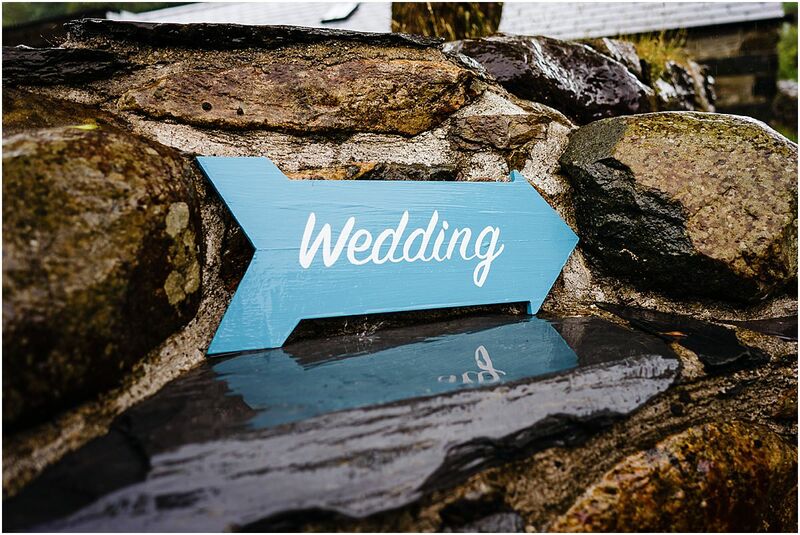 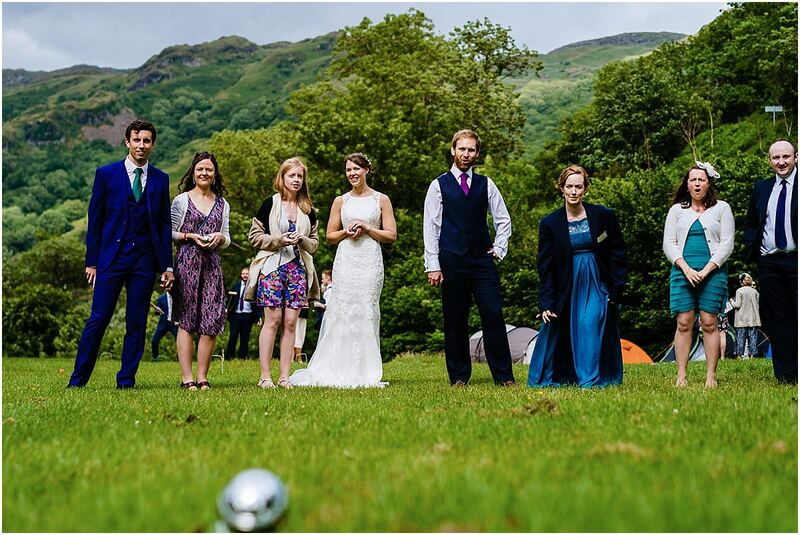 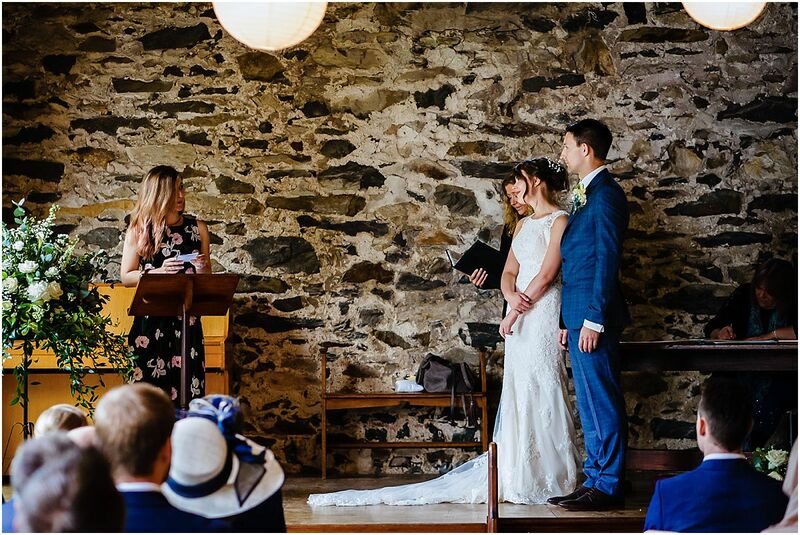 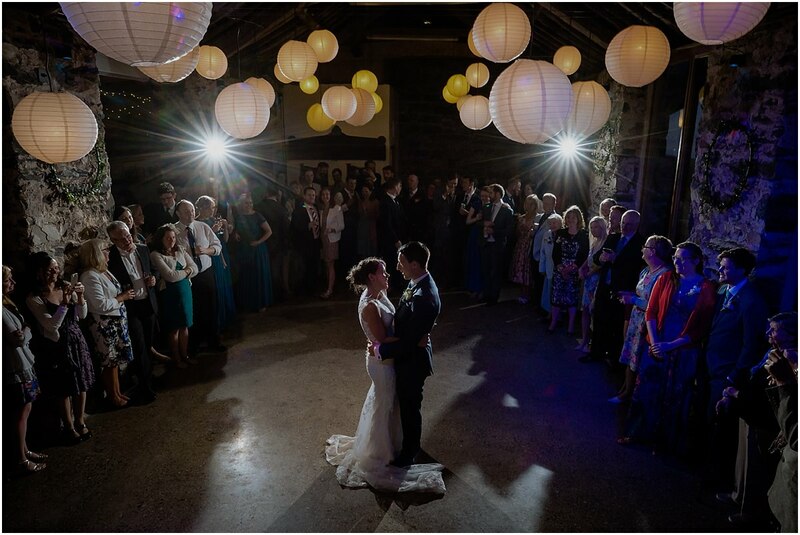 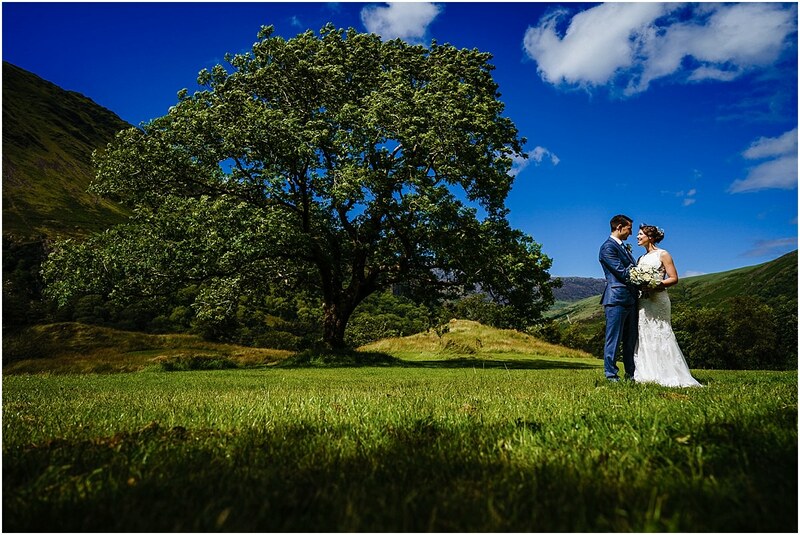 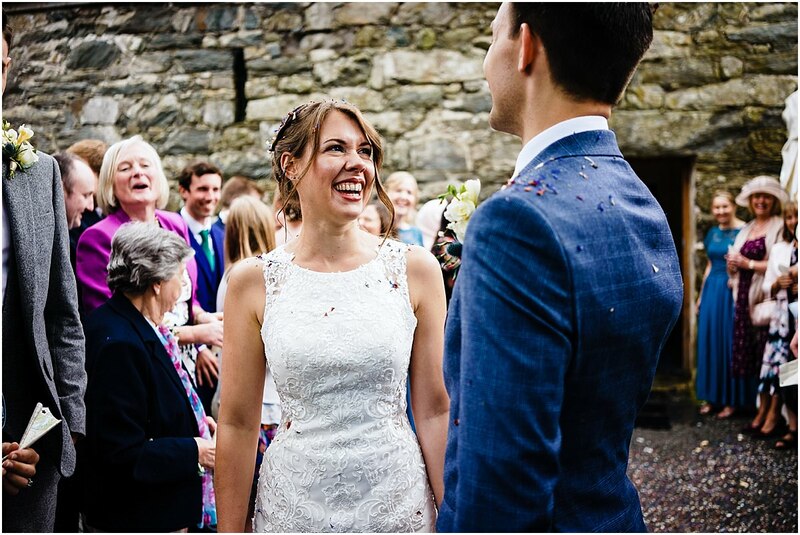 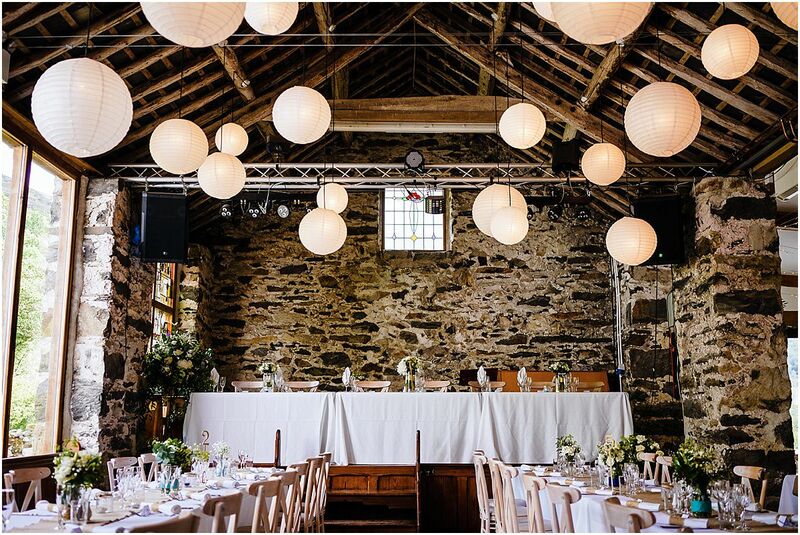 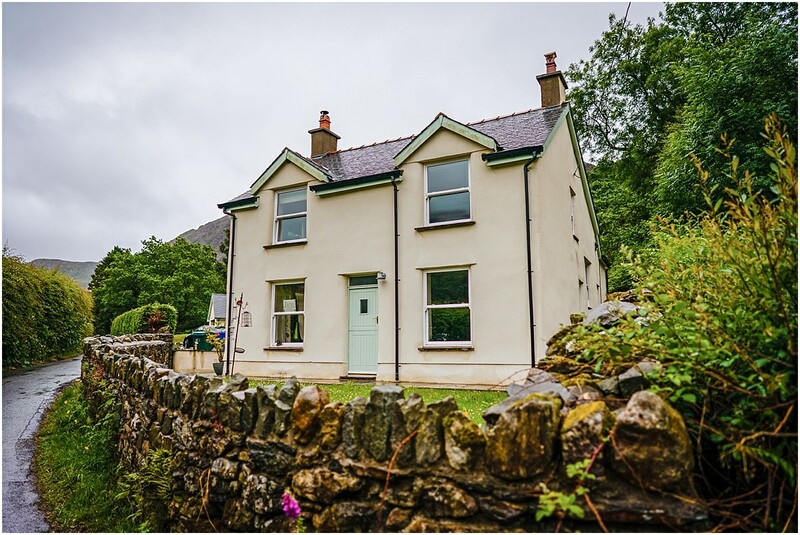 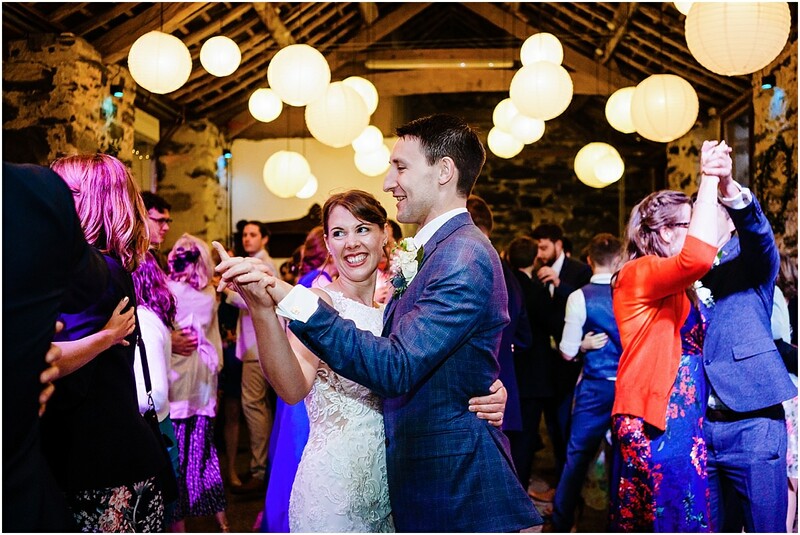 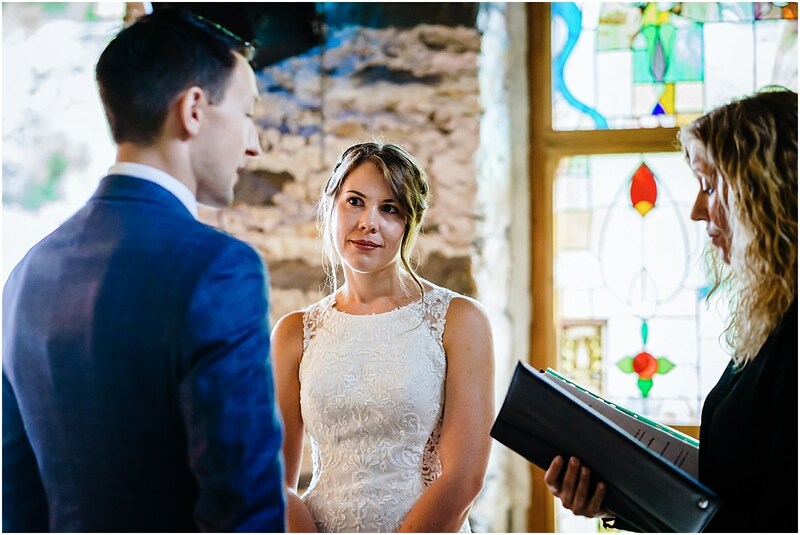 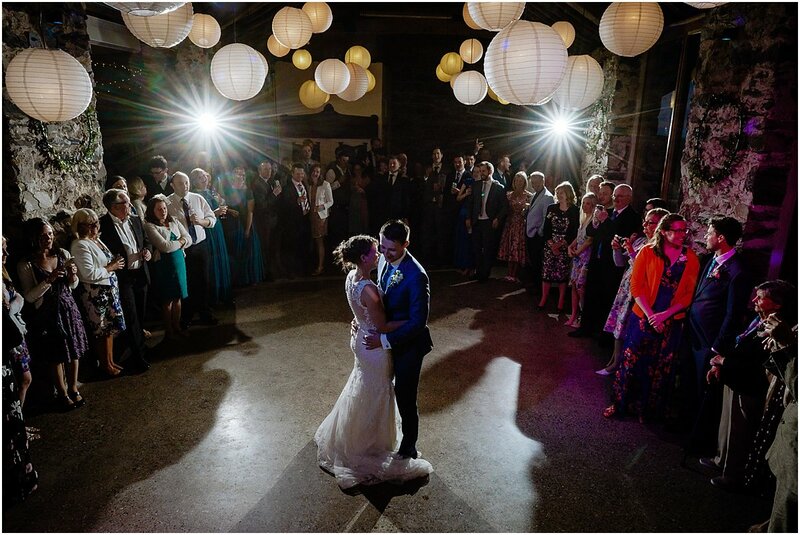 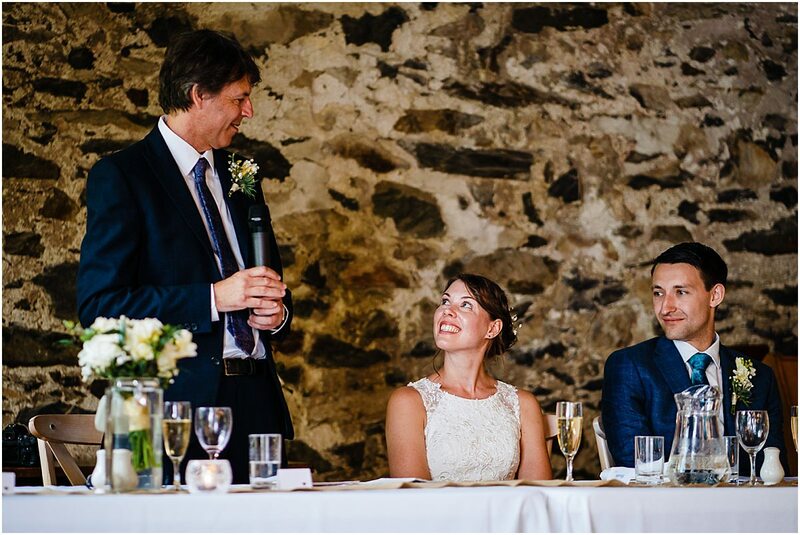 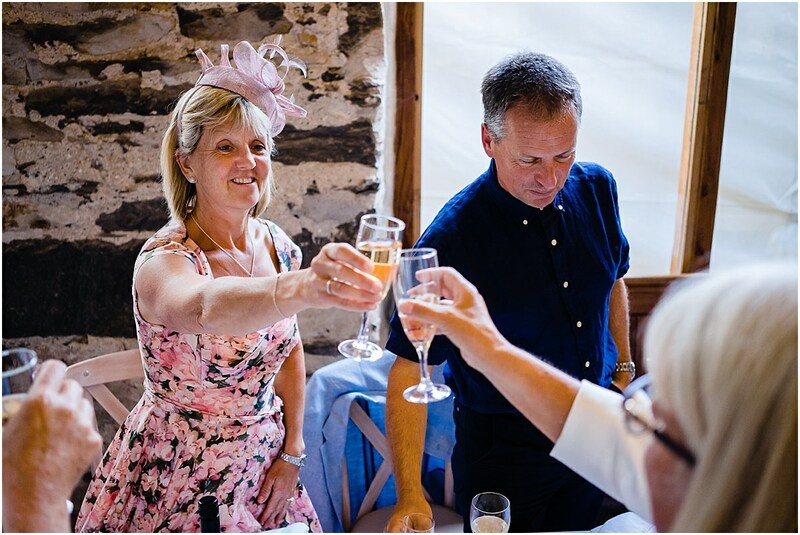 The venue they were married in was Llyn Gwynant Wedding Barns and campsite in Snowdonia. 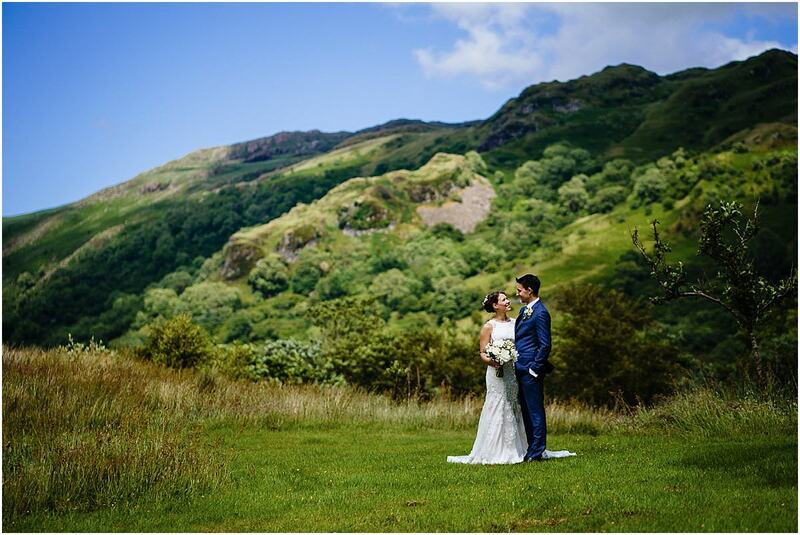 Although somewhat out of my usual area, I was eager for the opportunity to work with such breathtaking views as the Welsh mountains. 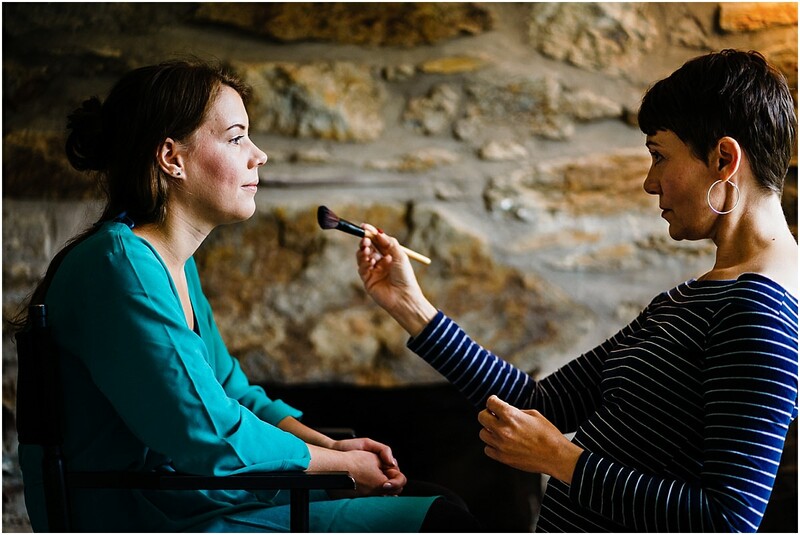 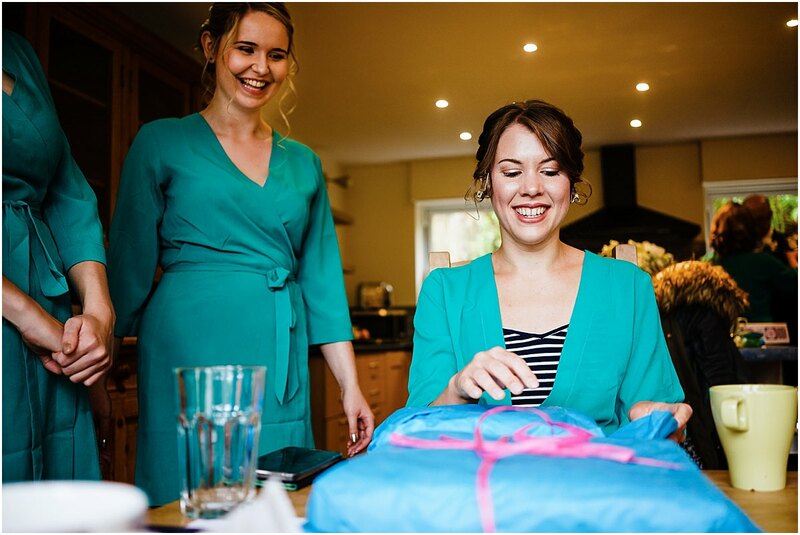 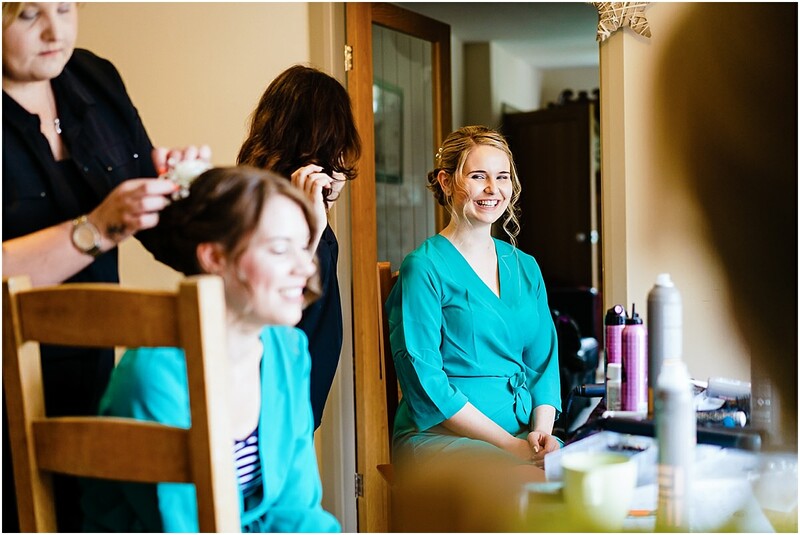 The day started off with Helen’s preparations at a beautiful cottage called Dryll. 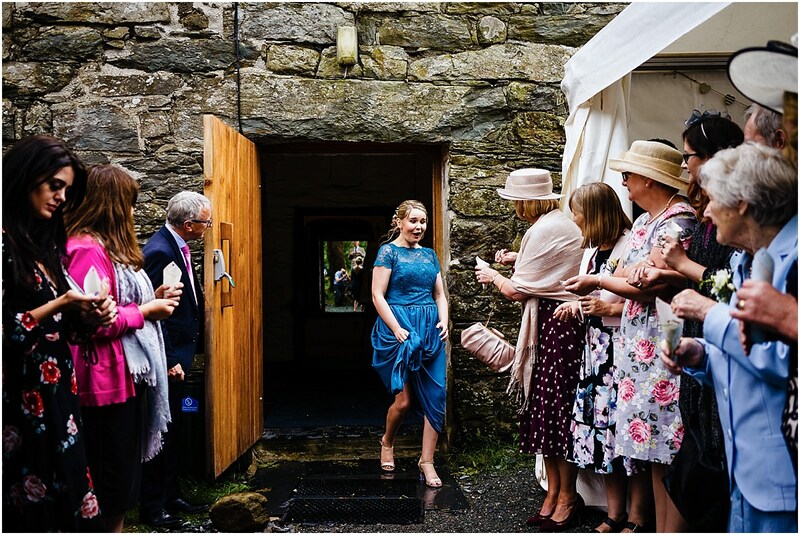 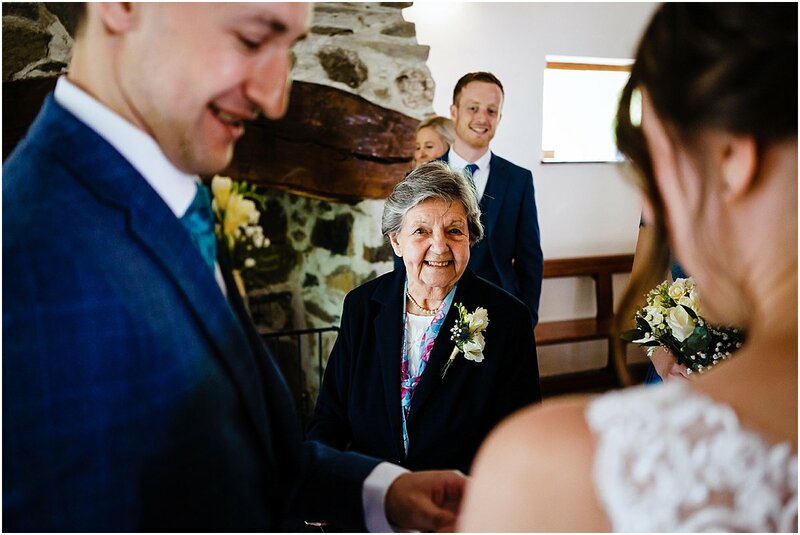 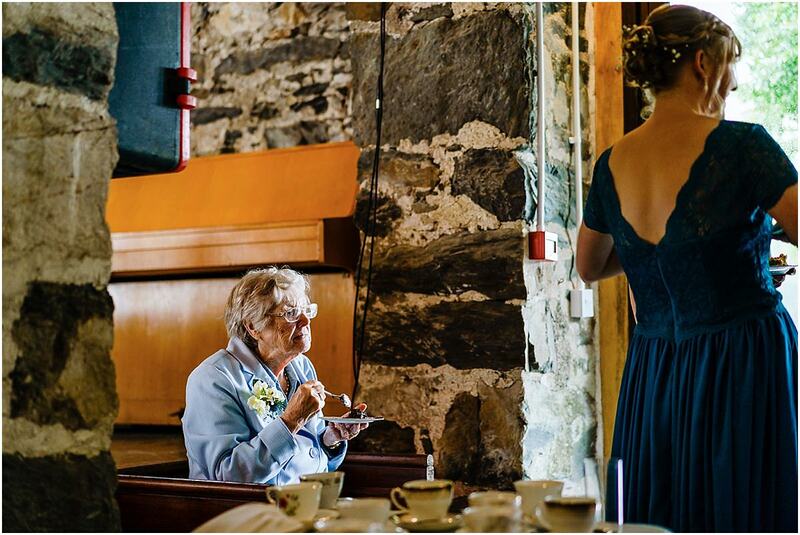 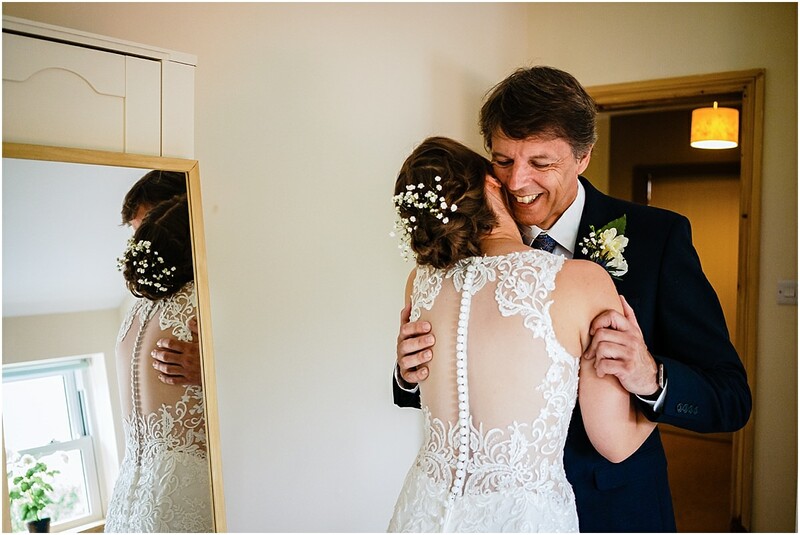 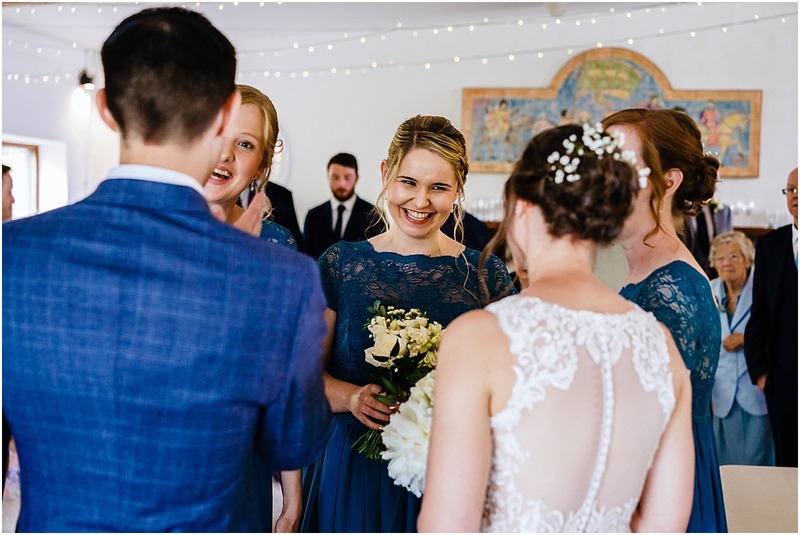 Accompanied by her family and friends Helen looked flawless as she applied the finishing touches and donned her gown ready to marry Mike. 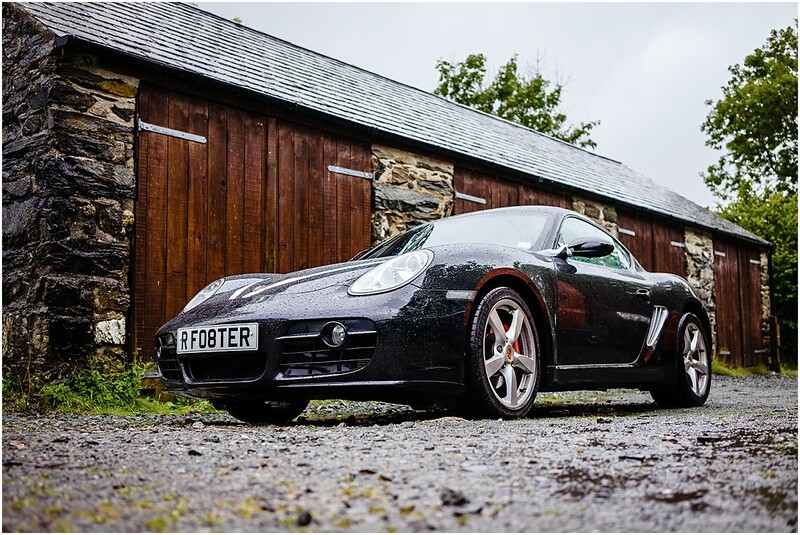 Helen was taken to the venue in a family friends Porsche, thats one cool way to arrive in style! 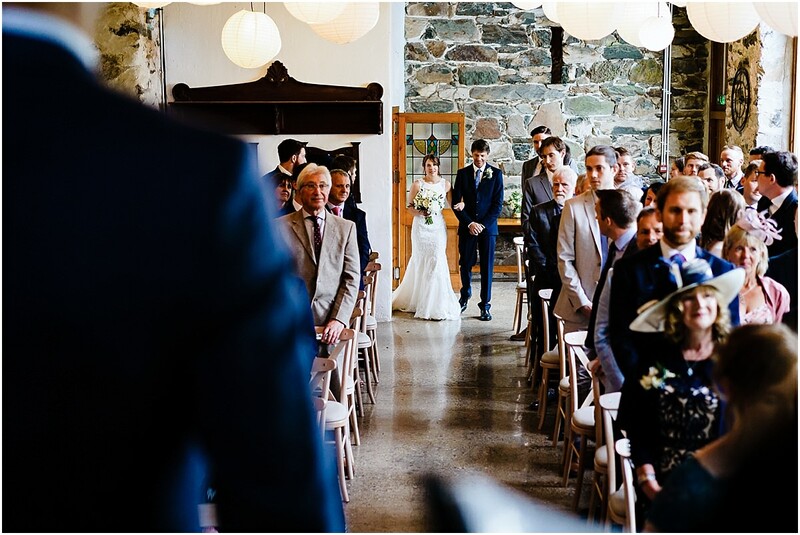 Mike waited nervously inside the venue for Helen to arrive. 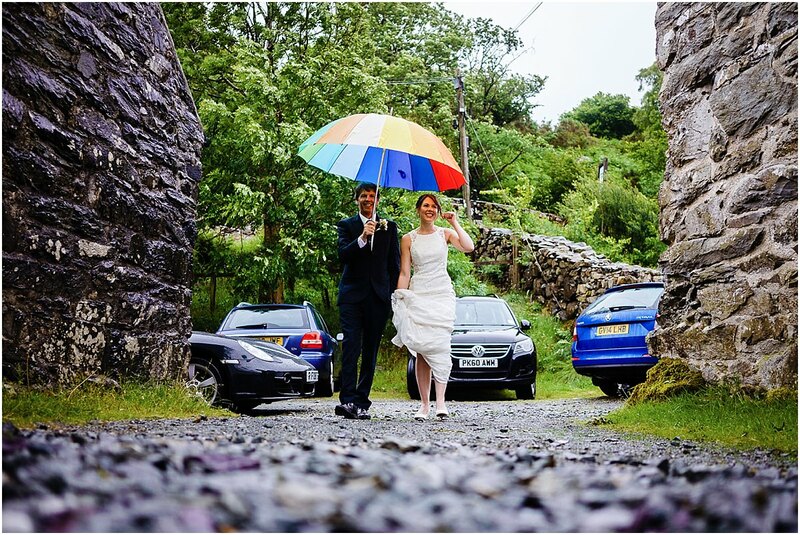 Unfortunately the rain was lashing down all morning, so Helen had to make a quick dash from the car to get inside. 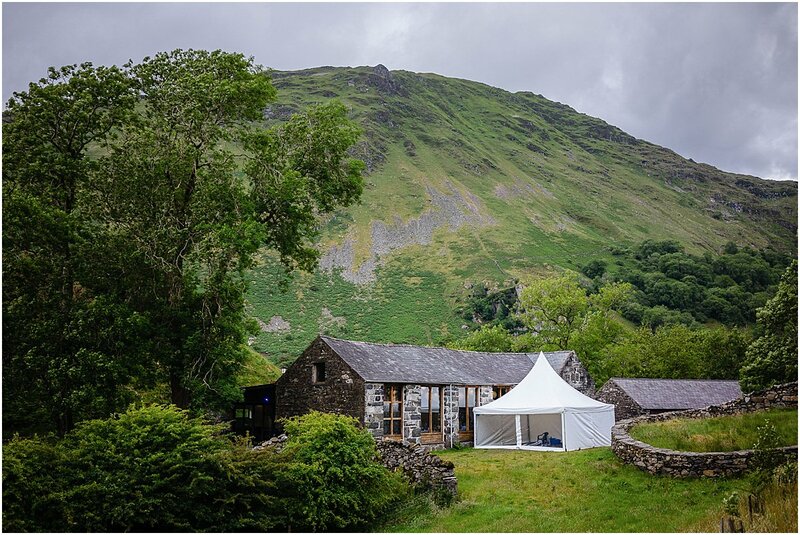 Llyn Gwynant Wedding Barns made a great setting for the wedding ceremony. 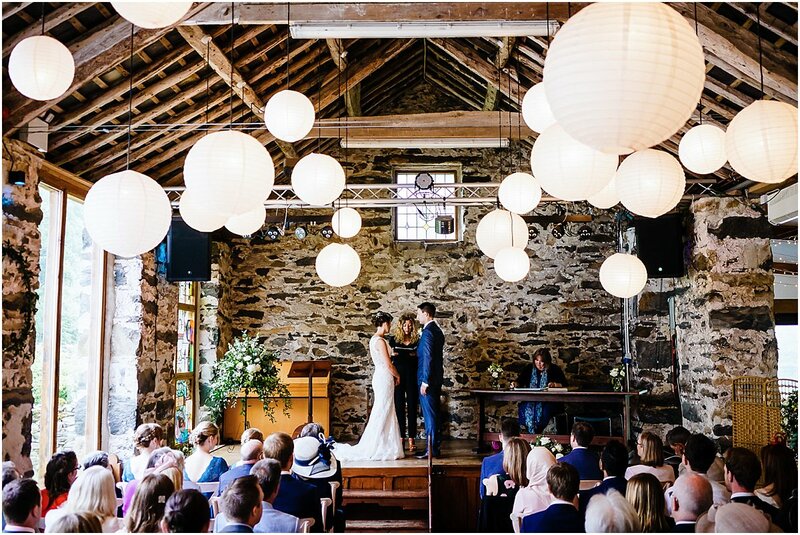 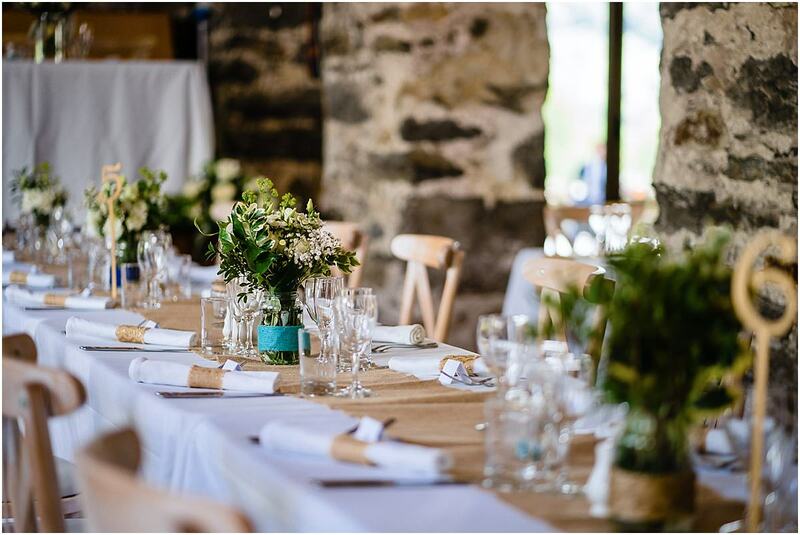 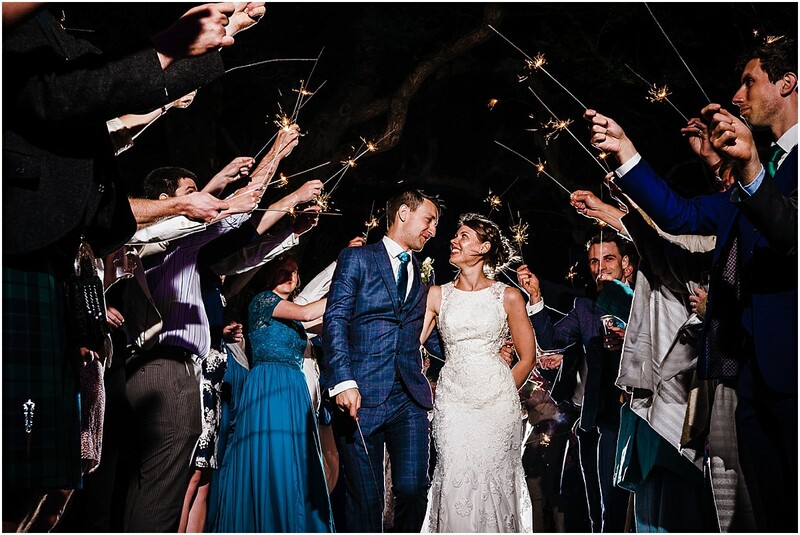 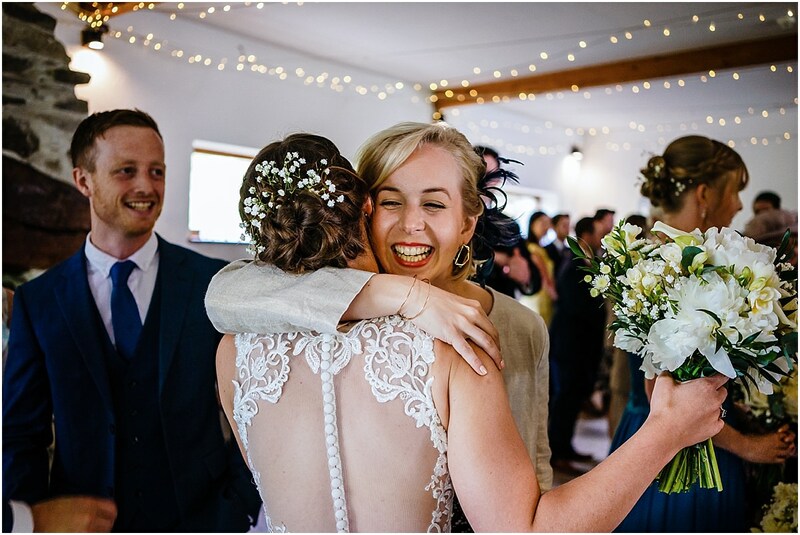 The couple had decorated the barn in a truely rustic style which was perfectly fitting to their wedding. 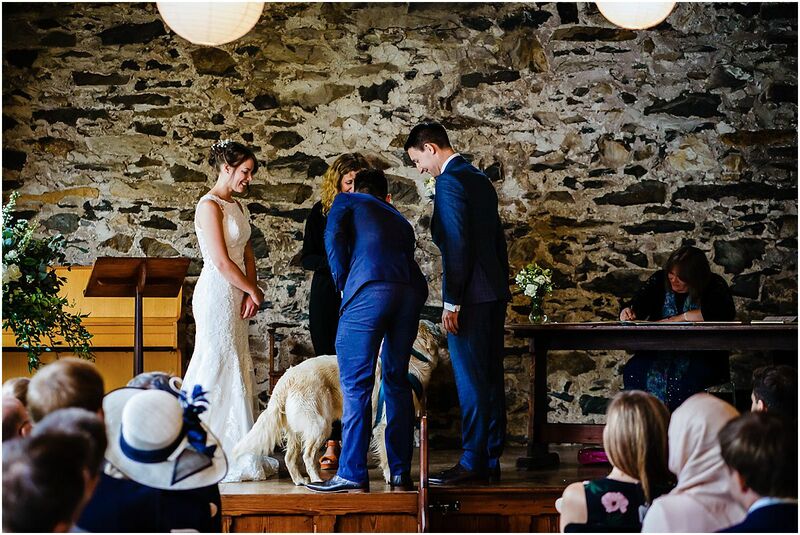 During the ceremony they even enlisted the help of their Golden Retriever as ring bearer. 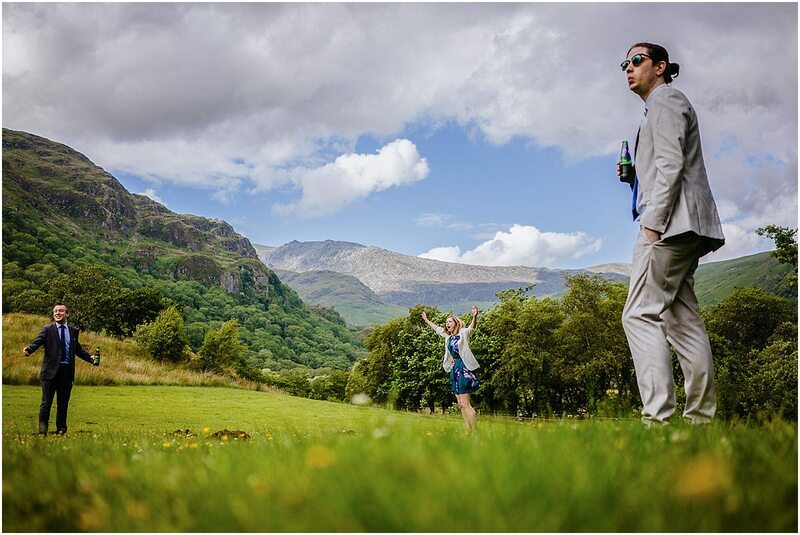 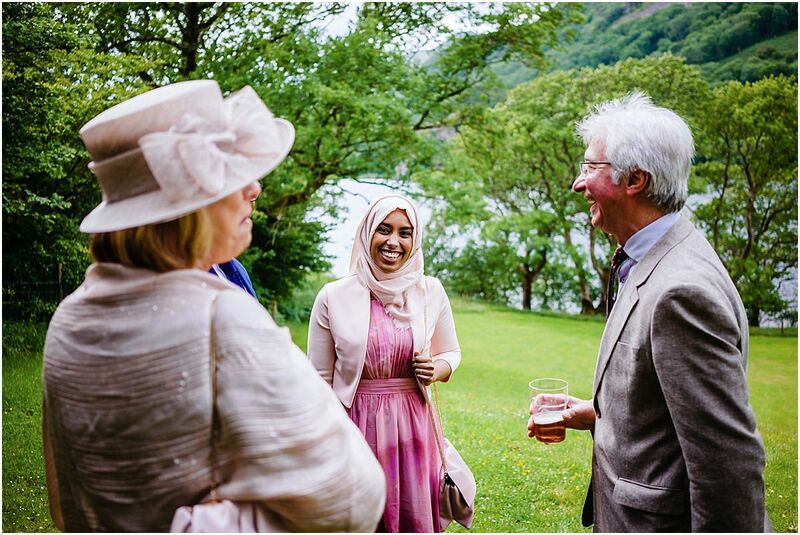 Shortly after the ceremony the rain stopped, the clouds lifted and we were able to get outside to enjoy the breathtaking views Snowdonia has to offer. 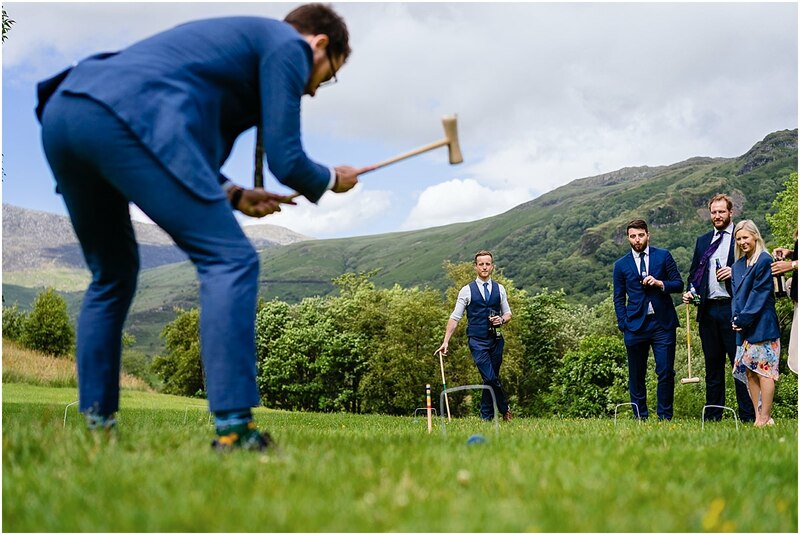 Helen and Mike had organised some lawn games for the guests to enjoy which made some excellent photos with such a great backdrop. 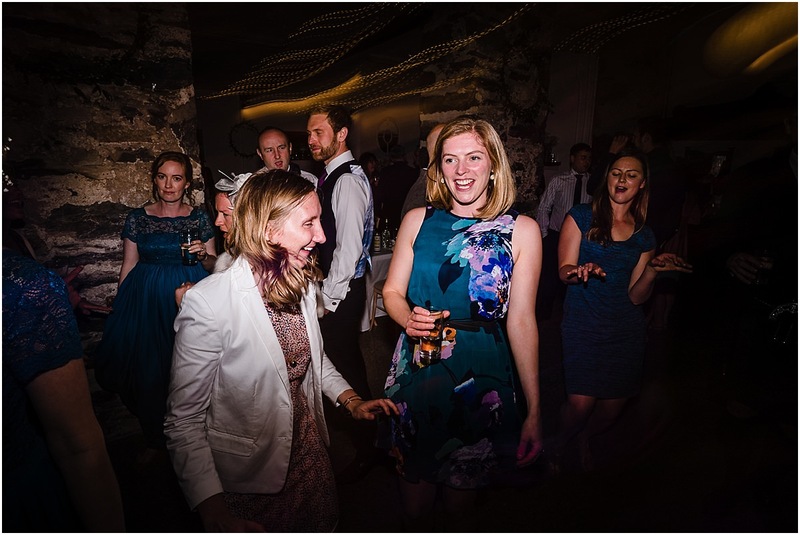 Later into the evening the music was pumping and the dancefloor was packed. 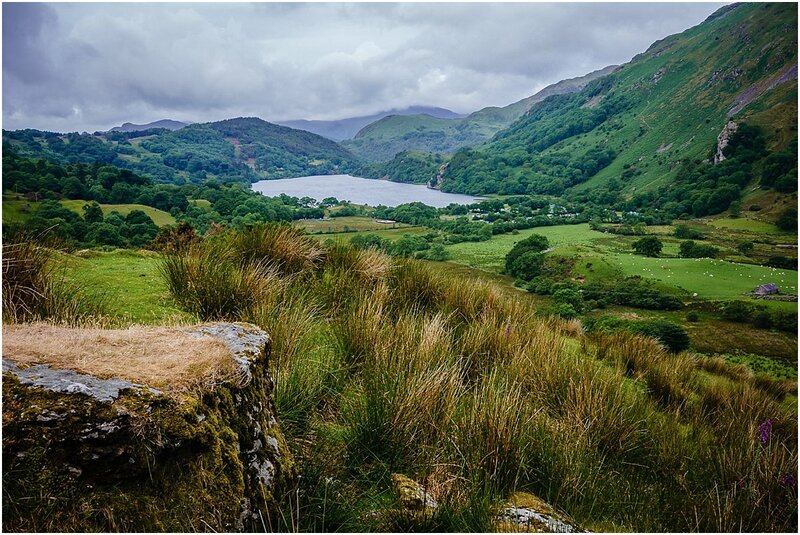 Due to the distance I had taken my tent to stay the night and it was amazing to wake up to such spectacular views. 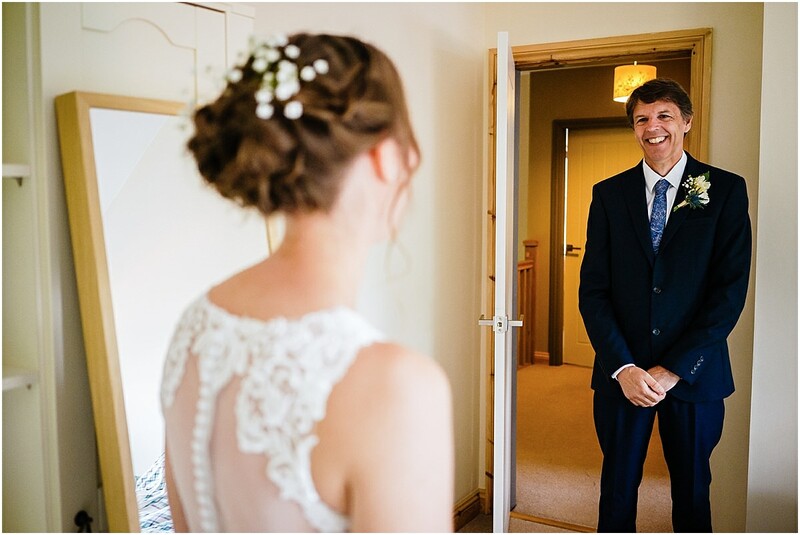 As well as having a thoroughly fantastic day, it was an absolute joy to photograph Helen and Mike’s wedding. 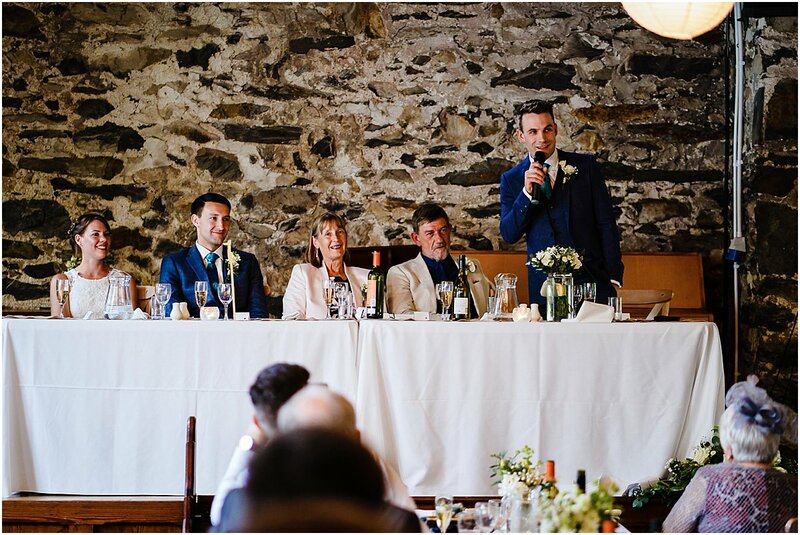 I was treated like a friend and a guest and I wish them all the very best for the future. 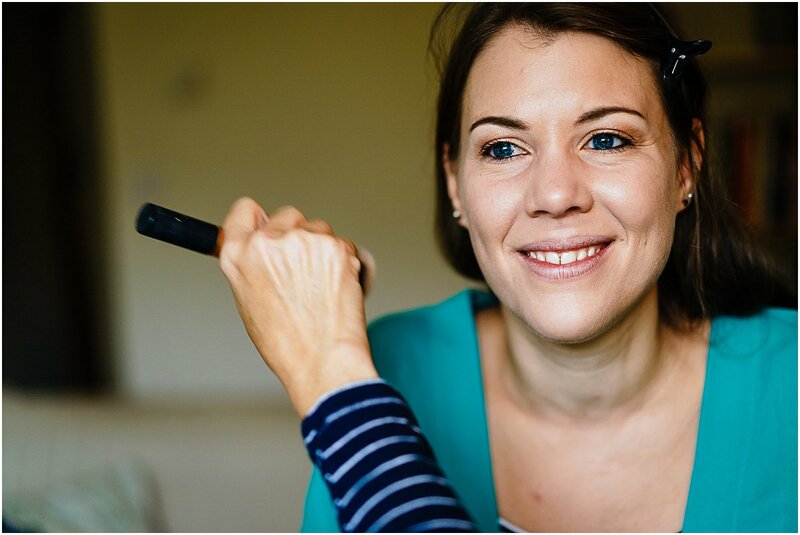 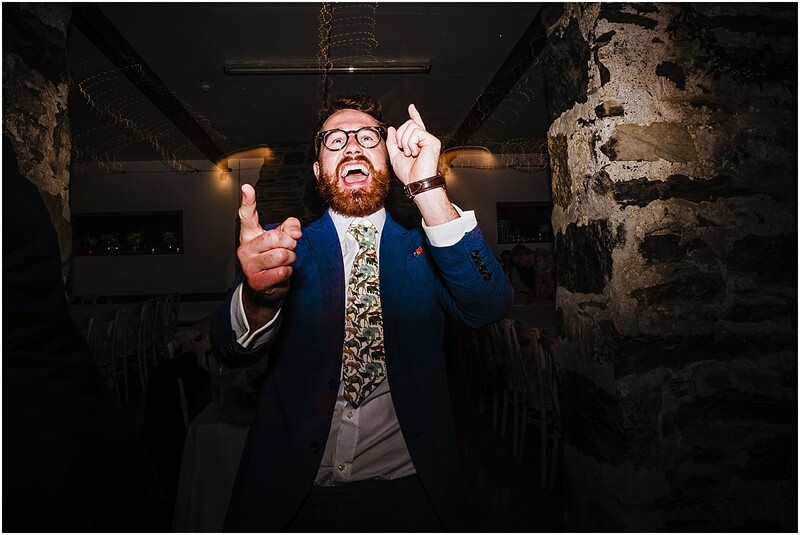 If you’re planning a wedding and would like relaxed documentary style photography please do get in touch to have a chat about your day. 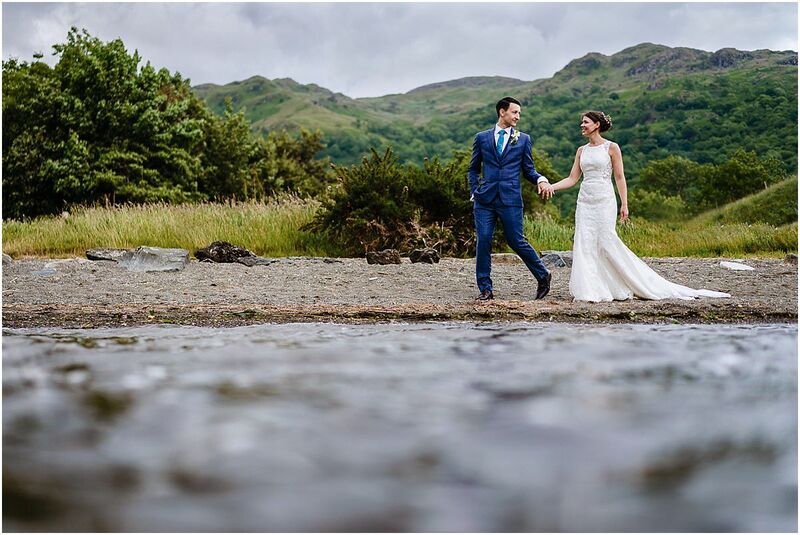 Fantastic as usual, After the weather we have been having good to see the weather got better for your couple. 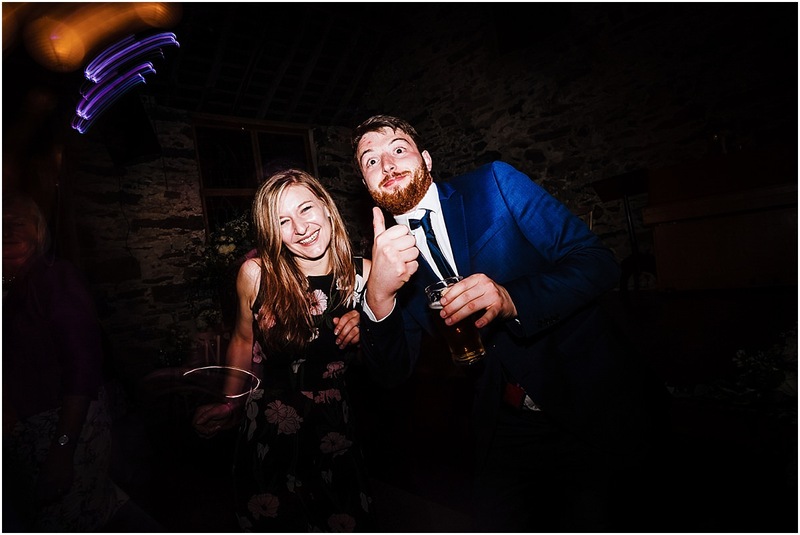 I particularly loving the hoop shot, you nailed that. 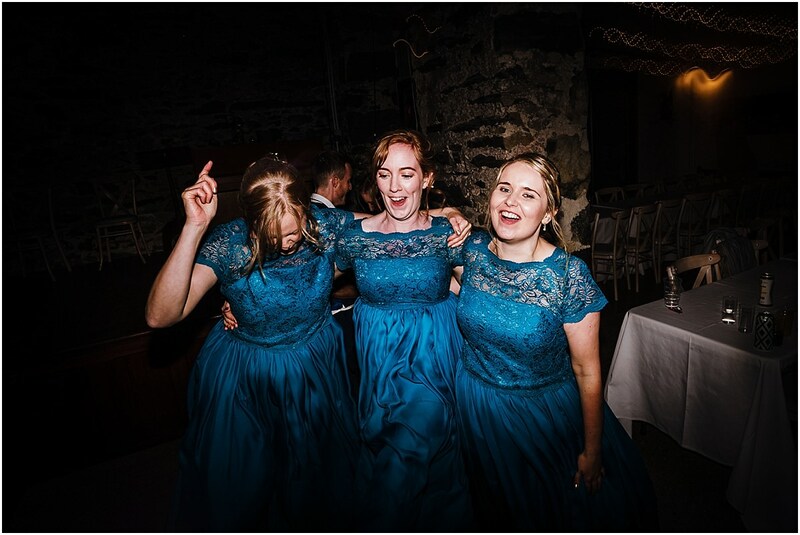 Keep up the amazing work as always.